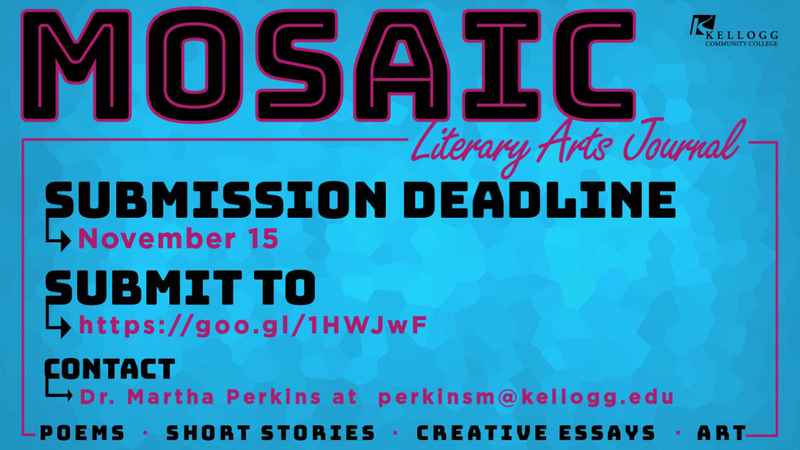 Kellogg Community College is accepting submissions of fiction, nonfiction and poetry for Mosaic, the student literary journal, through Thursday, Nov. 15. Submissions are open to current KCC students, who can submit up to five literary pieces for consideration for publication in the journal. Click here to submit your work via the online Mosaic Submissions form. For more information, contact English professor Dr. Martha Perkins at 269-660-2297 or perkinsm@kellogg.edu.